If you are or have been a Whitman student or even a prospective student, you have most likely heard of Whitman’s Outdoor Program. Through the Outdoor Program, there are a variety of outdoor activities available, such as hiking, kayaking, skiing, snowboarding, and more. Students can also rent gear from the Outdoor Program, such as camping gear and a variety of other outdoor related gear. While other schools might have similar outdoor programs, Whitman has a unique resource that helps students access the Outdoor Program. Through the Bob Carson Outdoor Fund, established in 2012, each student has $150 each school year that can be used towards fees associated with the Outdoor Program. My first year, I felt pretty hesitant about going on any of the Outdoor Program trips. Because of several physical issues, I didn’t think that I could handle the intensity of some of the more adventurous programs. However, near the start of the school year, my roommate asked me if I wanted to go on an OP trip with her called “Moonlight Hike.” Since it sounded relatively low-key, I decided to give it a shot and go with her. 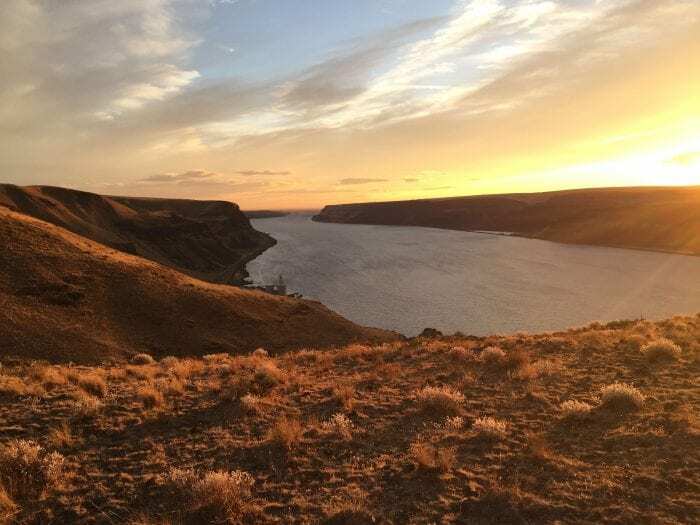 The hike took place near Wallula Gap by the Columbia River. Despite being called a “Moonlit Hike”, we ended up going before it became dark so that we could watch the sunset. It took us about half an hour to get to the top of the hill, where we ate dinner with a beautiful view of the sun slowly setting over the Columbia River as boats in the far off distance slowly moved across the river. We also watched a train on the other side of the river slowly pulling a long line of train cars. While it was very windy and a bit cold, it was totally worth it! I got to see perhaps the most beautiful sunset I had ever seen while eating a well-deserved dinner with my fellow hikers. After finishing out dinner, we explored the top of the hill for a bit before turning our headlamps on and heading back down the hill. I would encourage everyone to give a trip a try, even if you do not consider yourself to be “outdoorsy.” With all the different kinds of trips, there’s a variety to choose from and it’s a great way to get off campus and get to know more people while doing something fun and active. This entry was posted in Outdoors, Student Life.